Buchen Sie jetzt! Baubilligung $ 335 / nt! Willkommen in Kamilo 111, wo Ihre Big Island Vacation beginnt wirklich! Geben Sie die Tür zu diesem wunderschön eingerichtete Haus und Sie werden sofort das Gefühl, die Abnutzung der langen Reise hier beginnen zu schmelzen, wie Sie die 15 Fußteil Türen zu öffnen und steigen Sie auf Ihrer Veranda und blicken auf den üppigen grünen Landschaftsbau, dass umgibt, was Sie zu Hause für die nächste Woche anrufen (oder drei?). Wir bieten temporäre Rabatte in Höhe von 65 USD pro Nacht, da auf benachbarten Grundstücken temporär gebaut wird. Der vorherige Übernachtungspreis betrug 399 US-Dollar und wurde auf 335 US-Dollar pro Nacht gesenkt. Bitte erkundigen Sie sich für Details. Die festliche Zeit gilt nicht, da Bau-Moratorien vorhanden sind. 3 geräumige Schlafzimmer, jedes mit eigenen High-Definition-Fernsehern und bequemen Betten, warten auf den müden Reisenden, der Sie dazu einlädt, sich zu entspannen und ein Nickerchen zu machen, bevor Sie den Strand erreichen. Die Gourmet-Koch in der Küche bittet um etwas frische Insel Fisch oder Gras gefüttert lokalen Rindfleisch für die ganze Familie gekocht werden, während die Lounge-Sitzbereich im Freien ist der perfekte Ort, um mit einem Mai Tai nach einem langen Tag am Strand entspannen . Was auch immer Ihr Sinn für Abenteuer mit sich bringt, hat der Big Island ist, vom Schnorcheln mit Delphinen und Mantas, den Gipfel des Mauna Kea, und alles dazwischen Snowboarden! Bitte zögern Sie nicht eines unserer Ferienhaus-Spezialisten erfordern Ratschläge über Orte zu gehen, Dinge zu, und Sehenswürdigkeiten zu sehen zu tun! Wir möchten, dass Sie Ihre Big Island Urlaub zu einem wirklich unvergesslichen Erlebnis werden, und wir werden alles tun, was wir können, um sicherzustellen, dass Sie einen komfortablen und erholsamen Aufenthalt. Vergessen Sie auch nicht, dass wir im Mauna Lani Resort zwei erstklassige Golfplätze haben. Kontaktieren sie heute über Rabatte für die Gäste zu bitten, auf dem Grundstück bleiben und eine Startzeit zu reservieren. Had a bumpy start to our stay, but the property management stepped up and resolved all issues. Location is perfect, house is great. Working with James and Kai was wonderful. 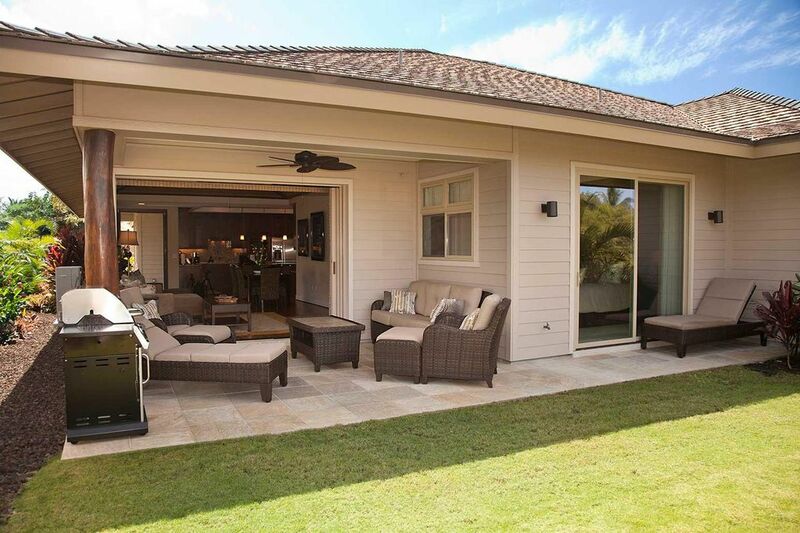 The home is well appointed with a picturesque view off lanai. Plenty of beach chairs, an umbrella, and a cooler for beach days. Will be back next year. great location, clean and contemporary furniture. Top shelve, highly recommend. Our family of 4 (ages 50, 48, 25, and 21) had a wonderful stay at this fantastic rental from Dec 22 - 31. The Christmas week on the Big Island is a really busy time at all of the restaurants, beaches, and hotels. What a perfect way to enjoy the big island and escape to a great home away from home for our family time! The golf view is fantastic, so much that we ended up playing golf on Christmas Day. The home is situated on the North course of Mauna Lani. We walked to the Fairmount for dinner and Brown's. The shopping center is right down the street. The kitchen is a chef's paradise. We loved the community pool, although the heater was out of service so the water was a little cool and had a nice "cool" tub, versus "hot" tub. The cold water was great for swimming laps. The owner's stocked this house with so many extras. We loved the location and the house. The beach club was great, a little crowded for Christmas, but we did see whales from the overlook which was a bonus. The snorkeling was excellent at the beach club. Our family loved Hapuna Beach which was about 3 miles away....even though it was crowded everyone had a spot and it didn't feel overcrowded.. Hope we can rent again real soon! Mahalo, Kai and James for the management and to the owners who made their piece of paradise a rental option! The best thing about this home is the property manager, James Sullivan. We had a few minor bumps during our 5-week stay, but with each issue James was responsive, prompt and professional. This is a nice home in a great development. The pools and gym are among the best we've seen in Mauna Lani, save for the the Mauna Lani Fitness Club, where you generally have to pay a daily or weekly fee. We used the recreation areas extensively and really enjoyed them. If you plan to cook, you'll be pleased with the assortment of cookware, utensils, flatware, dishes, etc. What is lacking are decent knives. There are two sets, both of which are so dull, I couldn't sharpen them with the sharpener I brought (dull knives are often a problem in rental properties, so I travel with a sharpener and often with my own knives). There is a great desk area in the kitchen that isn't shown in the photographs, but that we used as our "office/charging station" for the electronics we brought with us. When we were there, the internet was spotty at times but that has likely been corrected by now, as James was aware and was planning to have it worked on immediately after we left. This house has nice privacy in the back yard area, but it is directly next to a construction yard where the crews begin working (and talking loudy) between 6:00 and 6:30 AM each weekday. It was never an issue for us as we are early risers, but if you like to sleep in, you'll want to keep the windows closed so you don't hear them. The only real negative about the house for us was that it needs a deep cleaning - the kind where all the cabinets and drawers are emptied, the wood work, windows and doors throughout are washed, the stained furniture and carpets cleaned, and various repairs are done. This is a common situation with rental homes in that many owners need to have their places rented as much as possible, leaving very little time for the kind of extensive cleaning that you need when one group after another is coming in for a week or more.